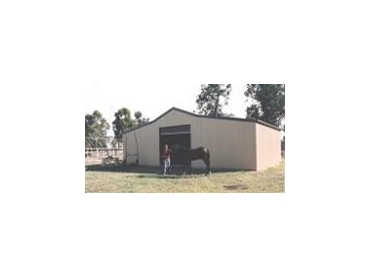 Wide Span Sheds has a leading range of barns, to suit all applications and budgets. From American style Barns to Classic, Country, and the De Luxe style Super Classic, Wide Span Sheds is 100% Australian owned and operated and has something to suit every Australian. Wide Span Sheds is also building on its early export success and aims to export 5,000 buildings to over 30 countries in the next 5 years. The American Barn is ideally suited to adding a loft in the middle, higher section. The building can be used in a number of storage, workshop and stable combinations - at incredible value for the span (width) sizes available. You can design the areas in heights, widths and lengths to suit your personal requirements. vertical or horizontal external cladding, cladding types and colours to name a few. All of our buildings are custom ordered and manufactured from cold rolled steel coil. That means high strength, no wastage or additional costs to get you what you want. You are not paying for the "next size up" as a result of pre cut lengths being cut down to suit your needs. Our "second to none" buying power and service from our suppliers ensures the most competitive pricing for you. + Optional Extras - PA Door, Colonial Windows, Loft for storage, Stable doors, Skylights and Colorbond roof.